I'm so tempted...it has "striped anglaise with pulled up skirt" written all over it. But it looks like it might be a dupion fabric which is not so good. What to do, what to do ? I'm going to ask the seller about the width and weight and see what he/she says. But almost 10 m of fabric for 250 SEK...its a great price. 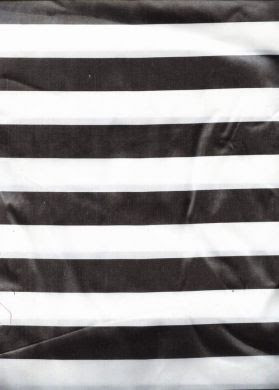 I'm having crazy ideas of matching it with a black/white striped fabric and make that cutaway dress from the Marie Antoinette documentary I've been blabbing about before. 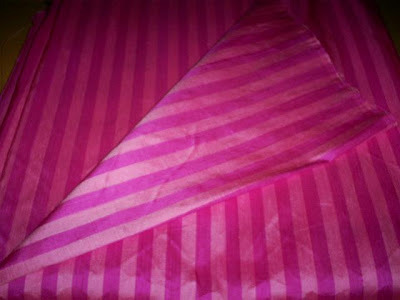 The idea is to use the black/white in the petticoat and main part of the bodice and the pink/purple in the top layer. At the back it will have two buttons for looping up the skirt. I have not decided if I should go with 3/4 sleeves or long sleeves yet. 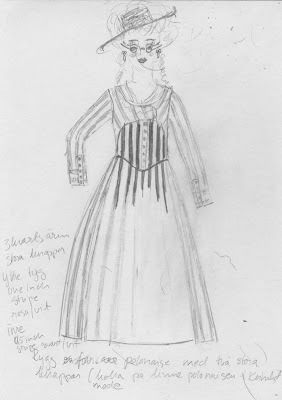 I will either make a real polonaise jacket like the one in Cut of womens clothing ormaybe make the 1770's "polonaise" in Kvinnligt mode or maybe a striped short jacket (also from Kvinnligt mode) with a peplum and matching petticoat with ruffle. I think if you love the fabric, you should buy it. It will make you happy to wear it, and it is no less historically accurate than a lot of fabrics we use that do past the arbitrary snark tests. I think you should go for it! It would make a fantastic gown!